It all started with a flying machine. Celebrating the anniversary of Garrett Public Relations. He was getting ready to unveil it and was putting together a team to help get the word out—would I like to do the industry press outreach? The answer was a resounding yes! I worked as part of a small team with him to publicize his personal flying device. It was a resounding success from the PR side. After the initial media push, I ended up handling all the media outreach, working with him for several years. We achieved coverage in hundreds of publications and broadcast outlets around the world, from the Associated Press to the ABC Evening News to being named Time Magazine’s product of the year. It was even in a film (Agent Cody Banks). Quite a way to kick off my business. Both timing—and luck!—had a role to play in securing that gig. It’s hard to top a client like that, but since then, I’ve worked with many businesses ranging from tech companies, including startups, to manufacturers to small businesses in a variety of industries. And, while I’ve physically relocated back to my central Ohio roots, I continue to work with companies all over the world. Not a bad run. I can apply all the things I’ve learned about real-world public relations over the years in this new era where we have more ways than ever to communicate and more channels to get the word out in the form of self-publishing. Another plus is the focus on strong writing skills, which are valuable to ALL organizations. Yes, I never knew when I started what the journey might hold. It’s not always easy, but I wouldn’t trade it. Not even if I could fly. From SoloTrek to today, the journey’s never been boring. Here’s to the next 18 years. 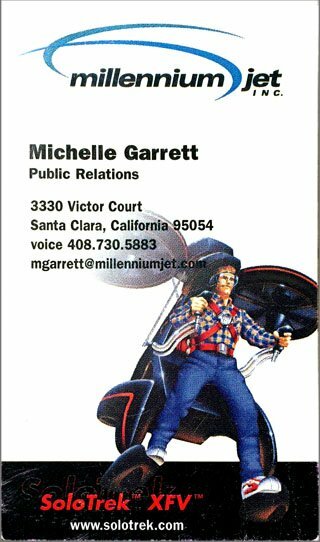 SoloTrek was my first client when I started Garrett Public Relations.